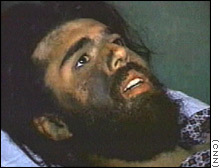 John Walker Lindh, a 20-year-old American from California, was captured while fighting for the Taliban. (CNN) -- John Walker Lindh spent his formative years in an affluent Northern California community known for its tolerance and open-mindedness. So how did he end up training in al Qaeda camps and fighting on the Taliban front lines in Afghanistan? In interviews conducted with CNN and U.S. military and intelligence sources, the once seemingly typical Marin County, California, teen revealed a journey of spiritual zeal, linguistic and cultural education and battlefield training that ended with Walker Lindh bloodied and dazed after a prison uprising last November near Mazar-e Sharif. "He's not someone that would, that I would have ever imagined, could pick up a gun at all," said his father Frank Lindh, who separated from Marilyn Walker about two years ago. An emotional Walker Lindh addressed a Virginia court at his sentencing hearing October 4, more than 10 months after U.S. military forces detained him in northern Afghanistan. He apologized for fighting alongside the Taliban, saying, "had I realized then what I know now ... I would never would have joined them." The 21-year-old said Osama bin Laden is against Islam and that he "never understood jihad to mean anti-American or terrorism." "I understand why so many Americans were angry when I was first discovered in Afghanistan. I realize many still are, but I hope in time that feeling will change," he said in a 14-minute statement, according to The Associated Press. Walker Lindh was sentenced to 20 years in prison as part of an agreement reached in July under which he pled guilty to one count of supplying services to the Taliban and a criminal information charge that he carried a rifle and two hand grenades while fighting against the U.S.-backed Northern Alliance. As part of the plea deal, the government dropped all other counts in a lengthy criminal indictment, including one of the most serious charges -- conspiracy to kill U.S. nationals. CIA officer Johnny Michael Spann was killed in the Mazar-e Sharif uprising. "He was a soldier in the Taliban. He did it for religious reasons. He did it as a Muslim, and history overcame him," his attorney, James Brosnahan, said in July. "John loves America," his father said. "And we love America. God bless America." Most Americans didn't believe Walker Lindh's father when the public first was introduced to Walker Lindh, or the "Taliban American" as he became known. When found in Afghanistan by U.S. military forces in November 2001, Walker Lindh was shoeless, covered in dirt and lying in a hospital bed, where he was recovering from wounds received in the prison battle. 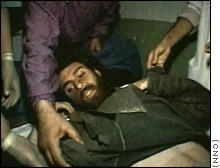 Initially, Walker Lindh expressed reluctance to be taped, but with the camera rolling and lights on, he told his story to CNN. Bearded, his face coated in grime, he appeared exhausted as he described his battlefield experiences and his reasons for becoming a Taliban soldier. "I was a student in Pakistan, studying Islam," Walker-Lindh told CNN in a non-American accent, which he attributed to the fact he been speaking Arabic exclusively for months. "I came into contact with many people who were connected with the Taliban. "I was in [Pakistan's] Northwest Frontier Province. The people there in general have a great love for the Taliban. So I started to read some of the literature of the scholars and my heart became attached to it. I wanted to help them one way or another." In secret documents summarizing his interrogations by U.S. troops and FBI officials, Walker Lindh said that he studied Arabic and Islam in Yemen starting in July 1998 and, after a brief return home to California, he returned to Yemen. He went to Pakistan in October 2000 and joined a radical Islamic group, getting military training to fight against Indian forces in Kashmir. After becoming disillusioned with the cause, according to interrogation reports, Walker Lindh asked to join the Taliban. Because he was not native to Afghanistan and did not speak the local languages, Walker Lindh said he joined the "Arab group" -- or al Qaeda, headed by bin Laden. Aware of al Qaeda's anti-U.S. position, he agreed to attend their camp, the documents said. Walker Lindh told interrogators that he declined to take part in operations against Israel and the United States, but continued with his training and even met bin Laden. "At some point during the training, Lindh said he had been offered to swear allegiance to ... al Qaeda," an FBI document said. "Lindh stated that he declined, however he swore allegiance to Jihad" -- or holy war against enemies of Islam, as defined by al Qaeda. Afghanistan was a long way from the Washington, D.C., suburb of Takoma Park, Maryland, where John Walker Lindh spent his earliest years. His father was a Catholic who worked as a government lawyer, and his mother was a health care aide who became a follower of Buddhism. He was the middle of three children. "I remember playing football, basketball, soccer, catch, stuff like that," Andrew Cleverdon, his best childhood friend, told CNN. When his son was 10, Frank Lindh accepted a job as a lawyer for Pacific Gas & Electric, and the family moved to Marin County, just north of San Francisco. Walker Lindh attended Tamiscal High, an alternative school for self-directed students in Lakespur, California. Frank Lindh described his son as "very musical, very adept at languages and very studious." He was also very interested in spiritual matters. Walker Lindh told FBI interrogators that he became interested in Islam at age 12 after watching the movie, "Malcolm X," which discussed Mecca, Saudi Arabia and the religious pilgrimage Hajj. In early 1997, as he turned 16, he became a Muslim and regularly attended a mosque in Mill Valley, California. He used the names Suleyman al-Lindh and Suleyman al-Faris. Despite Walker Lindh's independent spirit, he was eager to absorb the teachings of Islam, said Abdullah Nana, who prayed with him at the mosque. "It's my observation that new Muslims are influenced by the people around them. Whoever they lean on for their Islamic advice and for their Islamic questions, they will be influenced by these people," Nana said. Walker Lindh's journey abroad to study his newfound religion of Islam took many twists and turns. He joined Taliban forces in Afghanistan and was lucky enough to survive a prison revolt in Mazar-e Sharif. Frank Lindh called his son "a sweet kid" who was devoted and committed to his conversion to Islam. He said he was proud of his son's dedication to study the Koran and thought his conversion had been good for him. Walker Lindh's quest for knowledge about Islam carried him to Yemen for nine months in July 1998, according to interrogation reports. After going home to California, he returned to continue his studies in Yemen on February 1, 2000, and then left for Pakistan that October. In Pakistan, Walker Lindh enrolled in an Islamic fundamentalist school, known as a madrasah, where he became interested in the Muslim fight in Kashmir. Encouraged not to tell others he was American, he joined the Harakat-ul Mujahedeen-Al Almi (HUM), an organization blamed by Pakistan for terrorist attacks and failed assassination attempts on President Pervez Musharaff. Soon Walker Lindh became disillusioned with the HUM's cause and, after undergoing 24 days of military training, he instead chose to join the Taliban, according to interrogation reports. He told the FBI that he spent seven weeks at an al Qaeda camp -- al Farooq -- about a two-hour bus ride from Kandahar, beginning June 1, 2001. Three weeks were devoted to weapons familiarization, one week to studying maps/topography, one to battlefield training and one to explosives. Walker Lindh said he did not undergo any WMD training, although he said he believed al Qaeda offered such training in Kandahar. Walker Lindh told interrogators that bin Laden visited the camp several times, usually with one of his sons. Walker Lindh and four others met bin Laden on one occasion, and the al Qaeda leader "made small talk and thanked them all for taking part in the Jihad," according to the FBI report. Shortly before Walker Lindh left for Afghanistan, he sent his parents an e-mail message saying he was heading to a cooler climate. Frank Lindh said he did not know that his son was in Afghanistan until he saw him on CNN. "I had no indication or reason to be concerned that he would put himself in danger like this by going to Afghanistan," Frank Lindh told CNN's "Larry King Live." Bill Jones, a family friend in San Rafael, California, described Walker Lindh as "very sweet, unassuming, very spiritual young man -- rather frail, not an all-American football player or anything like that, certainly not a fighter." Walker Lindh's parents "were very, very upset and very confused because what they saw on CNN was frightening," Jones said. "They hadn't seen or heard from him in seven months, and they were desperate. ... They tried to get a hold of him. They couldn't, and so to see him lying on the hospital floor with his blackened face and his eyes rolling into his skull really frightened them." Walker Lindh had ended up in Mazar-e Sharif after being deployed to the Taliban front lines, where he was on September 11. His military questioners wrote that Walker Lindh "showed remorse and signs of regret" when asked about the terrorist attacks. Walker Lindh said one of his instructors had said the attacks were the first in three waves of attacks against U.S. interests. When the U.S. bombardment began, Walker Lindh told CNN that he fled 100 miles on foot to Konduz, where he was one of more than 3,000 Taliban soldiers taken prisoner in the garrison. He was disarmed and boarded a truck to Mazar-e Sharif. Walker Lindh was one of about 80 Taliban fighters who survived the prison revolt in late November near Mazar-e Sharif, in northwest Afghanistan. Northern Alliance troops put down the uprising with the aid of U.S. warplanes, but hundreds of prisoners, as well as Spann, were killed. The uprising was "all a mistake of a handful of people," Walker Lindh told CNN. "This is against what we had agreed upon, and this is against Islam. It is a major sin to break a contract, especially in military situations." He said he intended to surrender but was drawn into battle when one of his comrades threw a grenade. After taking a bullet in his upper-right thigh, he fled to the basement bunker, where he and dozens of other Taliban remained for seven days. During that time, gasoline was poured into the basement and ignited, and grenades were exploded. Walker Lindh, a thin man of about 5 feet 10 inches, described the basement as a dungeon and said it was full of the stench of dead bodies. He and the other survivors did not emerge until Northern Alliance forces diverted an irrigation stream into the bunker, flushing them out. "We were standing in water, freezing water, in the basement for maybe 20 hours," Walker Lindh said. "If we surrender, the worst that can happen is they torture us or kill us, right? Right here in the basement they're torturing us and killing us. We might as well surrender, at least we have a chance." Walker Lindh survived a week in a cramped prison basement that was flooded by Northern Alliance fighters. U.S. Special Forces later gave him medical attention. Walker Lindh was among three truckloads of prisoners -- most of them wounded or dead -- who emerged or were taken from the basement on November 29. Walker Lindh spent weeks on the USS Bataan, a Navy warship in the North Arabian Sea, being interrogated by U.S. investigators before he was transferred from the ship to a U.S. military post at Kandahar International Airport in Afghanistan. From there, he flew to the United States on January 23, a U.S. military source said. His return to the United States was an emotional one for his parents, who spoke with reporters outside a federal courthouse in Alexandria, Virginia, shortly after the January hearing. "My love for him is unconditional and absolute, and I am grateful to God that he has been brought home to his family," Marilyn Walker said. Under terms of his plea agreement, Walker Lindh cannot benefit financially from any telling of his story. He will also work with U.S. intelligence officials, telling them what he knows concerning the Taliban and al Qaeda. Should he again associate with terrorists, he could be brought back into court, where he would be considered an enemy combatant, said U.S. Attorney Paul McNulty. In addition, Walker Lindh withdrew any claims he was mistreated while in U.S. military custody. Brosnahan said his client would continue to study Arabic, the history of Islam and the Koran while in prison, and that he expected he would be able to serve out his term in a facility closer to his family, in Northern California. Federal prosecutors have told the judge they have no objections to Walker Lindh's request to serve his prison time near his family.